*Address correspondence and reprints request to: Hassan Al- Husban, Consultant, ENT Department, RMS, Amman, Jordan. Al-Husban. Outcome of Management of Otosclerosis by Stapedotomy Compared to Stapedectomy in a Jordanian Population. Oman Med J 2013 Jan; 28(1):36-38. Objective: To study the success results rates and complications of stapedotomy compared to stapedectomy in the operative management of otosclerosis. Methods: This is a retrospective study of 50 patients who were treated surgically for otosclerosis. The medical records of these patients were reviewed for the type of operation performed, complications and the serial pure tune audiometries pre- and postoperatively for at least one year. Patients with conductive hearing loss not due to otosclerosis were excluded from this study. The medical records of equal number of patients (25 patients with stapedotomy and 25 patients with stapedectomy) were analyzed for hearing improvement or loss, postoperative nausea, vomiting, vertigo, nystagmus, perilymph fistula, reparative granuloma, labyrinthitis, tinnitus and perforation of the tympanic membrane. All operations were performed by the senior consultant-otologists of our department. Stapes superstructures were removed by crural scissors and stapes footplate was perforated by microdrill. Results: Out of 25 patients with stapedotomy, 22 (88%) developed complete closure (≤10 dB) of the air-bone gap on pure tune audiometry; in two patients (8%), the air-bone gap improved to less 20 dB, and recurrent conductive hearing loss (due piston slipping) in one patient (4%). On the other hand, in patients with stapedectomy, only 16 patients (64%) developed complete closure of the air-bone gap (≤10 dB) on pure tune audiometry, and in four patients (16%) the air-bone gap improved to less 20 dB, while recurrent conductive hearing loss occured in three patients (12%), one patient developed complete sensorineural hearing loss (4%), there was one case of fluctuating hearing loss due to reparative granuloma (4%), perilymph fistula was reported in one case (4%) and no cases of facial palsy or perforation of the tympanic membrane were recorded. Conclusion: The results of this study clearly show that stapedotomy gives better hearing results and fewer complications than stapedectomy. The aim of this study was to compare the success results and complications of both these procedures in the management of otosclerosis. This is a retrospective study of 50 patients who were treated surgically for otosclerosis at King Husein Medical Centre of the Royal Medical Services in Jordan, between January 2006 and January 2009. The medical records of these patients were reviewed for the type of operation performed, complications and the serial pure tune audiometries pre- and postoperatively for at least one year. Patients with mixed hearing loss, other than otosclerotic causes of conductive hearing loss, revision cases and patients with atypical findings of footplate intraoperatively (obliterative, floating and gusher types) were excluded from this study to focus only on the complications from the type of surgery and exclude complications related to the patient or surgical findings. The medical records of equal number of patients (25 patients with stapedotomy and 25 patients with stapedectomy) were analyzed for hearing improvement or deterioration, postoperative nausea, vomiting, vertigo, nystagmus, perilymph fistula, reparative granuloma, labyrinthitis, tinnitus and perforation of the tympanic membrane. All operations were performed by the senior consultant-otologists of our department. Surgical approaches were either transcanal or endaural depending on the size of the external auditory meatus. Stapes superstructures were removed by crural scissors and stapes footplate was perforated by microdrill. All patients were given antibiotics for five days after surgery to prevent infection. Sutures and packing were removed after one week. Statistical analysis of hearing improvement following stapedotomy compared to stapedectomy was done using the student t-test with the probability value of p<0.05 being significant. Out of 25 patients with stapedotomy, 22 (88%) developed complete closure of the air-bone gap (≤10 dB) on pure tune audiometry. In two patients (8%) the air-bone gap improved to less 20 dB, recurrent conductive hearing loss (due piston slipping) was seen in one patient (4%), and no cases of perilymph fistula, reparative granuloma, labyrinthitis, tinnitus facial palsy and perforation of the tympanic membrane were recorded. On the other hand, in patients with stapedectomy, only 16 patients (64%) developed complete closure of the air-bone gap (≤10 dB) on pure tune audiometry; while in four patients (16%), the air-bone gap improved to less 20 dB, recurrent conductive hearing loss in three patient (12%), one patient developed complete sensorineural hearing loss (4%), and one case of fluctuating hearing loss due to reparative granuloma (4%) was reported. Complications such as perilymph fistula were reported in one case (4%) and no cases of facial palsy or perforation of the tympanic membrane were recorded (Table 1). Postoperative nausea, vomiting vertigo and nystagmus were reported in both groups but the severity and duration were more commonly seen in the stapedectomy group (7 days compared to 2 days mean time). Both stapedectomy and stapedotomy give excellent results for surgical treatment of otosclerosis. In experienced hands both techniques give satisfactory and stable long-term results.3 Stapes surgery is considered successful when air-bone gap is closed to less than 10 dB. In our study, 88% of patients post- stapedotomy resulted in air-bone gap less than 10 dB compared to 64% post-stapedectomy, which is statically significant (p<0.05). Postoperative sensorineural hearing loss is rare, but it is a devastating complication of stapes surgery. In stapedotomy, there is low manipulation and trauma to the inner ear and stapes superstructures resulting in a lower incidence of sensorineural hearing loss compared to stapedectomy. This is reflected in our study, no cases of sensorineural hearing loss reported post-stapedotomy compared to two cases following stapedectomy. Stapedectomy and stapedotomy are indicated not only in mild to moderate hearing loss, but also in severe to profound hearing loss. The most important and dangerous steps in stapes surgery are the excision of stapes superstructures and fenestration of footplate, which can be performed by simple perforator, microdrill or more accurately by laser. Abler et al. recommend CO2 laser in conjunction with a scanner system for footplate perforation to decrease complications such as perilymph leakage, inner ear irradiation and uncontrolled perforation.8 In the present study, we used the Microdrill which is a safe and effective tool, especially in thick stapes footplate and obliterative otosclerosis. To increase the success rate, it is also important to give the patient postoperative instructions and precautions. Patients should avoid increasing pressure in the ear by lifting heavy objects, coughing, sneezing, blowing nose, flying airplanes, swimming and exposure to loud sounds. It is also important to avoid getting the ear wet by plugging the ear with cotton ball soaked in Vaseline when taking shower. 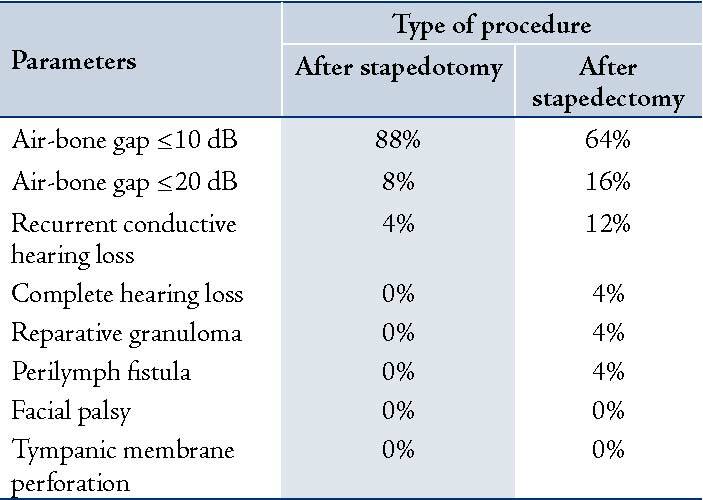 Figure 1: Air- bone gap closure <10dB (PTA) using stapedotmy vs. stapedectomy in different study groups. Souza et al. in their study “Otosclerosis and Stapedectomy” found that Stapedotomy greatly reduces the chance of a perilymph fistula (leakage of cochlear fluid).11 This is reflected in our study, where no cases of perilymph fistula were reported post-stapedotomy compared to one case post-stapedectomy. The results of this study clearly show that stapedotomy gives better hearing results and fewer complications than stapedectomy. 1. Makarem AO, Hoang TA, Lo WW, Linthicum FH Jr, Fayad JN. Cavitating otosclerosis: clinical, radiologic, and histopathologic correlations. Otol Neurotol 2010 Apr;31(3):381-384. 2. Perkins RC. Laser stepedotomy for otosclerosis. Laryngoscope 1980 Feb;90(2):228-240. 3. House HP, Hansen MR, Al Dakhail AA, House JW. 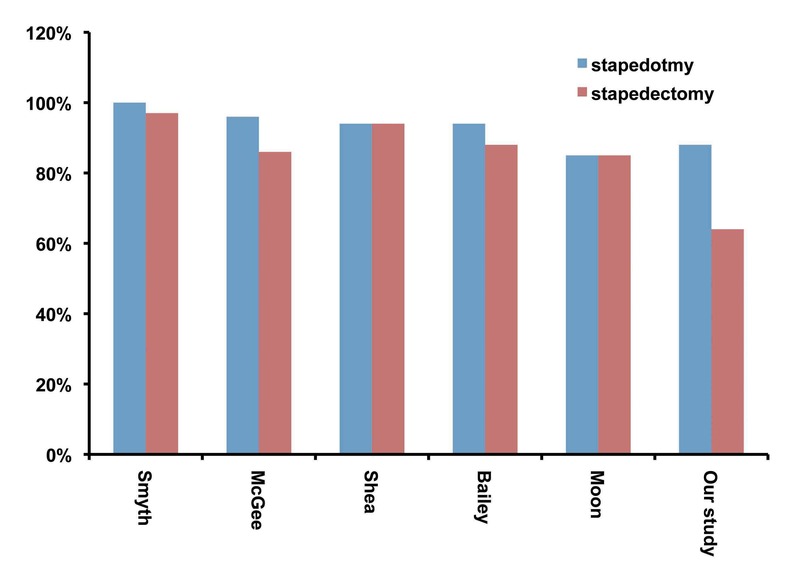 Stapedectomy versus stapedotomy: comparison of results with long-term follow-up. Laryngoscope 2002 Nov;112(11):2046-2050. 4. Kisilevsky VE, Bailie NA, Halik JJ. Results of stapedotomy in otosclerosis with severe and profound hearing loss. J Otolaryngol Head Neck Surg 2010 Jun;39(3):244-252. 5. Paum PB, Pollak AM, Fisch U. Utricle, saccule and cochlear duct in relation to stapedotomy: A histologic temporal bone study. Ann Oto Rhinol Laryngol 1991; 12. 6. Fisch U. Stapedotomy versus stapedectomy. Otol Neurotol 2009 Dec;30(8):1166-1167. 7. Laske RD, Röösli C, Chatzimichalis MV, Sim JH, Huber AM. The influence of prosthesis diameter in stapes surgery: a meta-analysis and systematic review of the literature. Otol Neurotol 2011 Jun;32(4):520-528. 8. Albers AE, Wagner W, Stölzel K, Schönfeld U, Jovanovic S. [Laser stapedotomy]. HNO 2011 Nov;59(11):1093-1102. 9. Motta G, Ruosi M, Motta S. [Stapedotomy vs stapedectomy. Comparison of hearing results]. Acta Otorhinolaryngol Ital 1996 Apr;16(2)(Suppl 53):36-41. 10. Sedwick JD, Louden CL, Shelton C. Stapedectomy vs stapedotomy. Do you really need a laser? Arch Otolaryngol Head Neck Surg 1997 Feb;123(2):177-180. 11. Souza de. Glassock. Otosclerosis and Stapedectomy. New York Thieme Medical Publishers 2004. pp 1-2. 12. Thamjarayakul T, Supiyaphun P, Snidvongs K. Stapes fixation surgery: Stapedectomy versus stapedotomy. Asian Biomedicine 2010;4(3):429-434.